This year’s breakdowns now include video of each hole being played, although your feedback is most appreciated on these designs. How do you play? 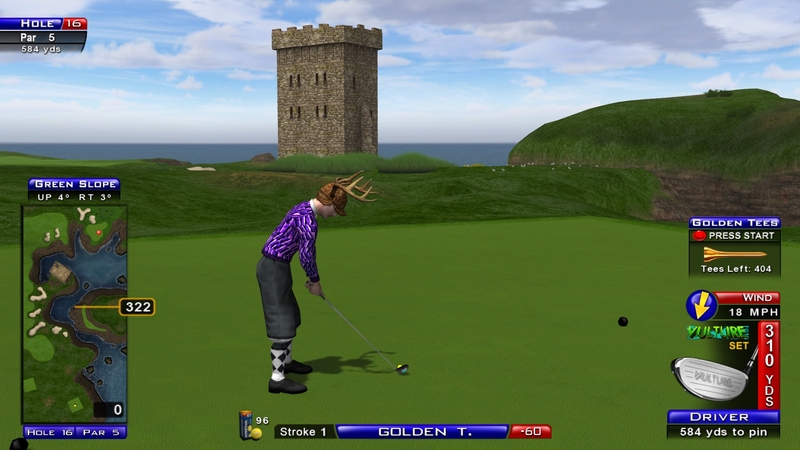 Share your strategy or Golden Tee Great Shots in the comments below. All holes will then be available for reference on the Course Caddies page—a bookmark must for the entire encyclopedia! Enjoy, and stay tuned for plenty more. The final par-5 of your round has decided to give you everything it has, and it has quite a bit to offer. Elevation, wind, cliffs, hazards and a tricky green make Hole 16 one of the more intriguing in the entire update. Perhaps more intriguing is the way to approach this hole on a round to round basis, which is precisely why we’re all here. Now, a few things. For starters, this green can actually be reached from the fairway. With a strong wind left to right and a closer to the tee box, you can blast your ball out as far as you can and actually get to the hole in two shots. This shot is rarely there, but it is there. In order to make it work, however, the conditions have to be just right. The other shot that is most certainly possible—and the place you absolutely cannot miss—is that small slab of fairway tucked into the side of the cliff on the right. This shot works, no question about it, and it can even be quite doable with a straighter wind. The problem with this shot is how little room for error you have. If you’re slightly off left or right—or even with distance—you’ll almost certainly get wet. That won’t completely destroy your scorecard, but you’d like to avoid it if possible. So instead, let’s do something completely different. In fact, before I talk about it, how about I just show you. Now, I know what many of you who have not seen this shot are thinking… what? 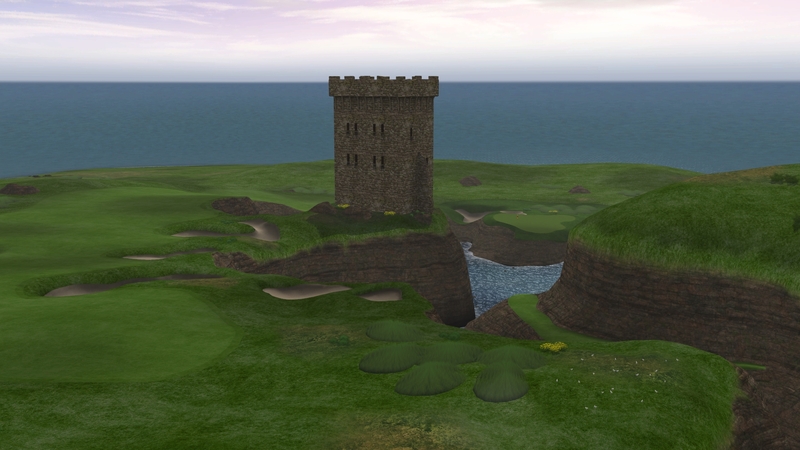 By aiming for the rough on top of the cliff, you can actually reach the green with great regularity. You need to be careful with your tee shot on a few fronts. For starters, it’s easy to go both short and long of the ideal landing area—that small patch of worn grass. But there’s also plenty of room to stop your ball and a high teed driver should help you end up where you need to be. With a strong wind directly in your face, this strategy becomes far more challenging. Your approach shot into the green becomes more difficult, and it’s something you need to be mindful of. When that is not the case, however, you should be able to carry the green with relative ease, although you’ll still have to play what will likely be a strong wind. Whew, that was a mouthful. Good luck.